Successfully Added The Super Sneak - Hidden In-Ear Audio Receiver Kit to your Shopping Cart. This wireless earphone receiver kit is extremely well hidden and next to impossible to detect. That’s because this device uses a miniature earbud that fits perfectly inside your ear with only a clear stem sticking out about a ¼ inch so you can safely pull it out. If you’re looking for the most discreet audio transmitter kit on the market, then continue reading to learn more. So how does it work? It’s simple! 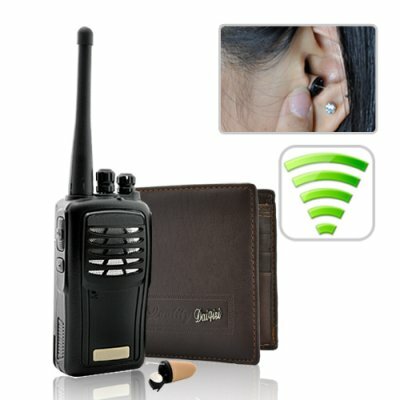 The included walkie talkie sends the audio signal to a transmitter hidden inside a normal looking wallet. The wallet transmitter then sends the wireless signal to the mini earbud where only you can hear the audio transmission. That’s all there is to it. You only need to carry the wallet and wear the discreet earbud to receive audio instructions from your partner-- no bulky receivers or messy wires necessary! This is the same technology undercover CIA agents have been using for years and is perfect for privately receiving instruction without anybody knowing the better. For example- you have an important presentation coming up but have limited time to prepare. Not to worry! Your partner can remotely give you instructions whenever you get stuck and don’t know what to say! Whatever you do, DON’T bring this device to your next card game! Yes you will gain an unfair advantage… However, if anyone does happen to figure out that you’re cheating then you’ll be in some serious trouble! If you plan on using this device for non-illegal purposes only then go ahead and place your orders now and we’ll ship your order out within 24 hours. And like all Chinavasion products, The Super Sneak comes with our full 12 month hassle free warranty. Battery Time Radios and Transmitter: 6-8 Hours depending on the usage. On standby up to 48 hours. Chinavasion is not responsible for the misuse of this product. The customer takes full responsibility for any unlawfully acts committed while using this product. For best results place wallet in top shirt pocket. Can I paint the earbud to match my skin tone? Sure. You can paint it any color you want. Just make sure the paint does not enter inside the device. Can I use the transmitter without the wallet? Yes, just make sure you carefully take all of the electronics and wires out and keep them protected.